As soon as I discovered that I was pregnant, I started reevaluating all of the choices that I had been making about my health–mainly focusing on what I was eating and my activity level. I knew that I needed to do better and make some changes in these areas because–of course–I want to create the healthiest environment for my growing baby. The only problem is I’m not the type of person who likes to workout. I actually don’t like it at all . . . I have to force myself to go because I will try to find any excuse not to do it. So I needed to find a solution that would help me with my goals for a better and healthier pregnancy. Luckily I was soon introduced to DEFINE. When I went to my first DEFINE class I was intrigued. Their studio and classes are nothing like I had experienced before. It made me want to learn more about how they would be able to help me during my pregnancy and postpartum. Luckily, I had the opportunity to sit down with one of the owners, Erin O’Leary Stewart, as well as several of their instructors. I learned a ton. First of all, this isn’t your average fitness studio. They have bigger goals for their clients and for their business. Their mission is to educate you on how to become your absolute best self in body and mind. And after going to DEFINE for several months, I could see the difference. These are eight ways I’m having a healthier pregnancy and planning on a healthier postpartum with DEFINE. The first class that I went to was a Body class at DEFINE. This is the class that everyone recommended that I try first. 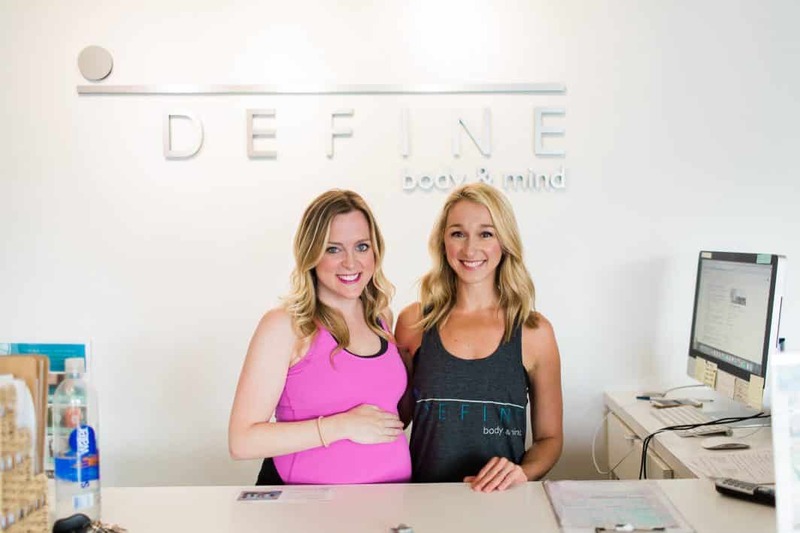 Erin, Co-Owner of DEFINE, says that she recommends all expecting mamas to start with this class as well. It’s meant to lengthen and build lean, long, strong muscles. It’s a full body workout that incorporates Pilates, yoga, ballet and core strengthening techniques. It also teaches you how to breath properly which is a great tool for labor and birth. I was hooked. They have some other great pregnancy safe classes as well that I’ve enjoyed. Yoga – their class is all about creating length and space in your body to help create openness and transformation. They make sure to cater the class to your specific needs. Mind – a soothing take on taking care of you both physically and mentally. It increases range of motion, improves energy levels and relieves chronic pain. A perfect compliment to their cardio classes. Revolution – an indoor cycling cardio class. I recommend taking this class if you are an avid cycler and are used to going to cycling classes. If you are new (like I was), get a bike in the back and go at your own pace. I looked and felt so awkward at my first Rev class, but thankfully they turn the lights down really low during the class and turn up the music so you can go at your own speed. Erin told me that they always encourage their clients to listen to their bodies. Choose a bike and grab some weights, a ball and a towel. The instructor will help you get situated on your bike before class begins if it’s your first Rev class. They want to make sure that you are safely on your bike and that you have a great class! Here’s Erin starting a warm up for the Rev class. They also have a bounce class which is a mini-trampoline class combining cardio and strengthening. This is the only class that expecting mamas should not take. It looks like a lot of fun though so I will definitely be signing up once my care provider gives me the go ahead to start working out post-baby. All of their instructors and staff members are there to help. That was something that was apparent. Even before I was pregnant, I’ve always had a difficult time knowing exactly what I should be doing for a good workout and making sure that I have the right technique. When I walked into each of my DEFINE classes, every instructor began by asking if anyone in the class was pregnant, if they had any limitations or injuries. I loved how they catered the class to their students and offered modifications for people who needed it like myself. I felt like I had a personal trainer, but that I got to enjoy a great workout with friends. And I knew that everything I was doing during my workout was safe for me and my baby. They truly are there to educate and help you so that you can learn and become your absolute best. Before every class, they recommend that you talk to your instructor first if you have any concerns or limitations. Erin explained how they go through a long and rigorous training with their instructors so that they are all fully trained on how to best take care of you. At DEFINE they believe that wellness is not just about exercise, it’s also about food. Erin’s background is not only in the movement arts, kinesiology and dance profession with extensive teaching experience in Pilates, barre, dance and fitness classes, but she also has a culinary degree from the Natural Gourmet Institute for Health and Culinary Arts. No big deal. 😉 When I asked her if weight loss and overall health and well-being is really 80% diet and 20% exercise, she said that she might even argue that it is 90% diet and 10% exercise! She and her team are very passionate about healthy eating and this is why she created DEFINE foods; a program dedicated to educating on the importance of whole foods health. Love their juice cleanses! Erin mentioned that they are all pasteurized and safe for us pregnant mamas to enjoy! So not only does this space offer services for physical fitness, but they also care and want to help when it comes to what you are eating and fueling your body with. I was very impressed. Did you know that women who exercise regularly during their pregnancies typically have faster births and fewer interventions and complications? It’s true! Labor and birth are physical events that you need to physically train for. Having strong muscles and a fit heart can greatly ease labor and delivery for you and baby. This was a huge motivation for me to figure out a workout routine that I would like, see results and would stick with. Thankfully DEFINE classes have helped me get stronger and be better prepared for my baby’s birth. Something else that I learned and have definitely improved on throughout my time of taking their classes is having better control of my breath. This may sound silly, but breathing during labor is everything. Controlling your breath can really help you manage pain. The DEFINE instructors focus on your breath during their classes so it’s a great practice for what you will also need to be mindful of in your birthing room. Erin helping me with positioning and reminding me of when to inhale and exhale during the workout. Also, in the event of a lengthy labor, your increased endurance can be a real help to make it through. Erin was telling me her birth story and how she was able to focus on her breathing and how she was doing DEFINE squats during her birth. Within a couple of hours–I think she said two hours–her son was born! Yes please; I’ll take that birth experience! In this study it showed that women who exercised regularly during their pregnancies recovered faster after childbirth compared to those who didn’t exercise. That’s huge! We all want to look and feel our best selves especially after having a baby. Babies require so much from their moms all of the time so to be able to quickly “bounce” back and feel like ourselves again makes that transition into motherhood that much easier. I’m grateful that these DEFINE classes are going to help me recover faster and feel stronger. Which leads me to my next point . . .
Over the years I’ve joined different gyms, have hired personal trainers, and have tried many different workout classes. When first starting at DEFINE I was skeptical that their classes would really make a difference, but I quickly learned that the investment is well worth it. As Erin said, “You’ll see better and faster results by regularly taking their classes.” I would agree! Not only have I seen results, but I have also been sleeping better, it has helped improve my mood as well as avoid feeling aches and pains during my pregnancy. Having a healthy postpartum time is very important to me. As soon as my care provider clears me to work out again, I know I will be going to the DEFINE baby classes. This 30-minute class focuses on arms, legs, glutes, and abdominals. All you have to do is bring your baby and your baby carrier and you are ready to go! It’s a great way to get out of the house, meet other mothers and clear your mind while getting a good workout. What’s also cool is that as your kids get older DEFINE also offers kids classes too! This is something that I immediately picked up on once I joined DEFINE . . . community. It really does feel like a welcoming atmosphere where their staff is rooting for you. Their instructors like to get to know you by name and make you feel at home. Also, their design esthetic in all of their studios is absolutely gorgeous. It makes you feel relaxed and welcomed as soon as you step foot through their doors. And I have felt this way after going to several of their locations. See which location is nearest you! The retail and check-in station at their River Oaks Houston location. You can purchase some of their collegiate non-skid socks for class. Hook ’em! A place for you to set your belongings down during your class. They also have lockers available too! Fresh towels outside each class room for their clients. The front doors of their River Oaks Houston location. I’m really grateful to have found this awesome resource and the wonderful people that I’ve met along the way. It’s been a great way for me to have a healthier pregnancy which I know will help me have a better birth, faster recovery and an awesome postpartum journey. Is Using Marijuana During Pregnancy and Breastfeeding Safe?